The Buffalo Catholic Diocese released a statement late Tuesday night responding to the news conference held earlier in the day by whistleblower Siobhan O'Connor, who previously worked as Bishop Malone's secretary. 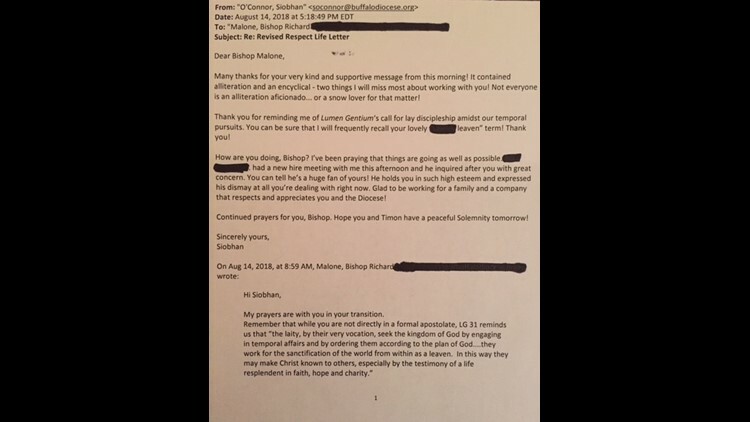 BUFFALO, NY - The Buffalo Catholic Diocese released a statement late Tuesday night responding to the news conference held earlier in the day by whistleblower Siobhan O'Connor, who previously worked as Bishop Malone's secretary. The entire statement is posted below. "Bishop Malone is stunned and dismayed at the comments of Ms. O’Connor at her press conference today. Her comments directly contradict her comments to him while she worked at the Chancery and even after she left. 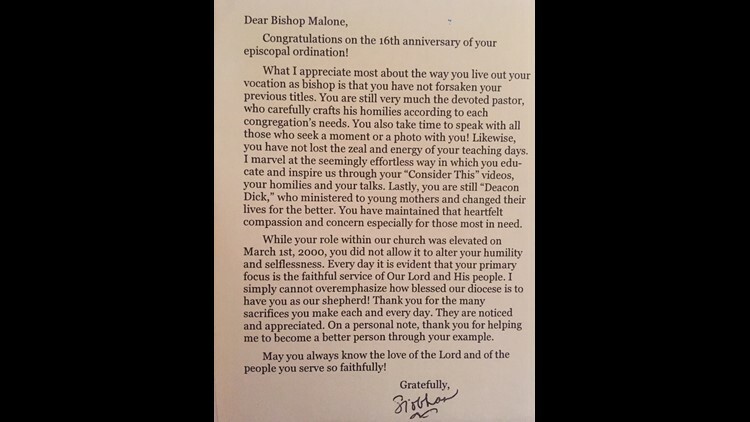 In fact, her prior, written communications to the Bishop demonstrate her complete admiration for the Bishop and his efforts to lead the Diocese. Her comments now are plainly and embarrassingly contradictory. 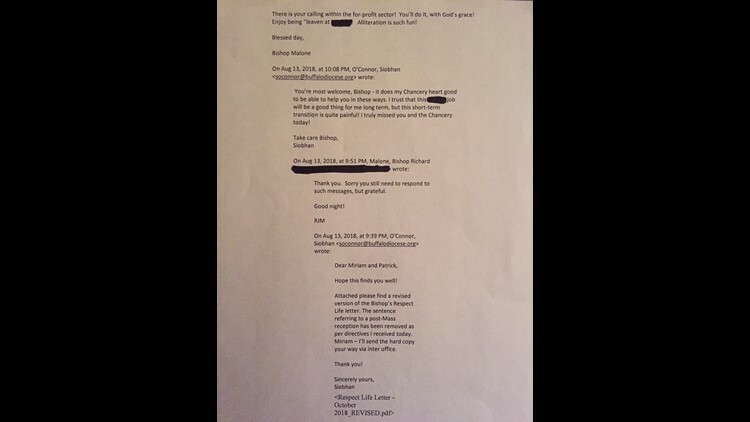 Here are her actual email communications with the Bishop and others at the Chancery that she now criticizes." 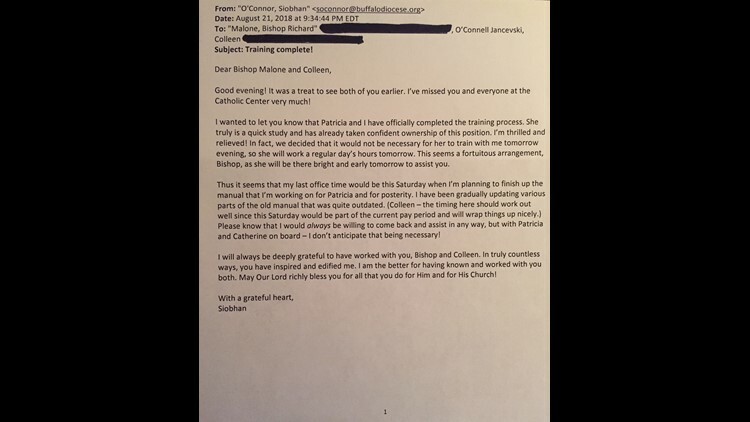 The Diocese also released five emails O'Connor sent to Bishop Malone and her former co-workers at the Diocese. My greeting is taken from the last written words of Stephen Foster, the American songwriter. It seems an appropriate salutation as these will be my last words to you as your colleague. How I will miss you all! Through tumultuous times and many memorable moments, it has been my pleasure to work with you in various capacities. One of the perks of being an Executive Assistant of this nature is that I was able to collaborate with very nearly all of you at some point or other. Know that I am grateful to have been your colleague and to have been part of the Catholic Center team. When I was younger, I was a huge fan of Michael Jordan, whom I referred to as MJ. Little did I know that 20 years later I would meet the really awesome MJ: Mary Jablonski. Mary is the human equivalent of sliced bread, indoor plumbing and air conditioning - you can’t imagine life without her once you’ve known her. My heart aches to think of my impending Marylessness. It has been an incredible gift to work alongside her these past three years. Mary: I thank you, I love you, and – you guessed it – I appreciate you! Father Ryszard is the most real person I’ve ever met. He is real cool, real funny, real resourceful, real helpful, real smart, real compassionate, real holy, and real honest. I am a better person for having known you and worked with you, Father – thank you. Thank you, Bishop, for all of the opportunities I’ve had and lessons I’ve learned while working for and with you. You have my heartfelt gratitude. I will always pray for you and your Chancery staff as I know so well the burdens you carry! My other prayer is that Father Baker may intercede for the presbyterate and diocese of which he was once a part. As challenging as this time is, it can be a season of grace for us. The Flannery O’Connor I’m not related to once wrote that “all human nature vigorously resists grace because grace changes us and the change is painful.” This is surely a painful time for all of us, but let us trust that it can be a graced time as well! May we emerge a changed Church in the very best sense. This message is quickly becoming more of an epistle than an email! Forgive me its length, but I have so much on my heart at this time. The most important thing I want to say is: thank you! My heart is filled with gratitude to and for all of you and to God most of all. When I review the book of my life, I will reread my Catholic Center chapter with great fondness and gratitude for all that I’ve learned and experienced. May you always know the loving mercy of our good and gracious God!